This was a completely ordinary moment. Just three people sitting on a bench. 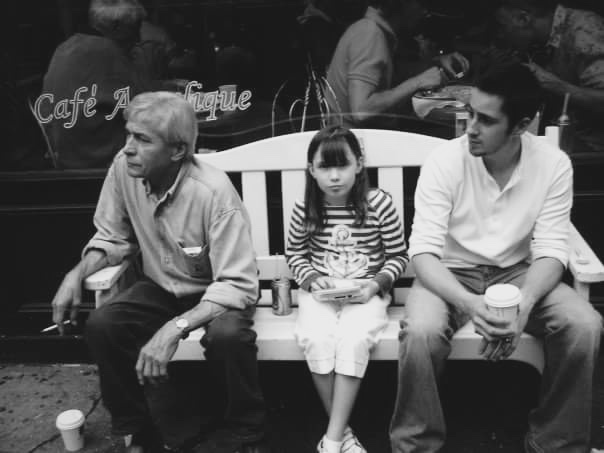 My dad, my niece and my husband. What made it extraordinary is that it was taken the day after my wedding in New York. I took this photo without any thought or composition, but it's one of my favourites. We'd spent the afternoon wandering around Greenwich Village; people watching, drinking coffee and eating cupcakes from The Hummingbird Bakery. It was the perfect day with my favourite people. Nine years on and my dad isn't with us anymore. People say it gets easier with time. It doesn't really. The bad days are further apart than they were at first, but no less painful. So, for a moment, I just want to dedicate this little space of the internet to him. My dad. Byron. A wonderful, funny, generous, kind, brave, talented, warm and extraordinary man. He is hugely missed and always will be. He sounds absolutely incredible; no wonder he's missed. I hope you got through today OK. This is a beautiful photo. I think sometimes these uncomposed ones are just perfect, more perfect than any extensivly studied compostion could be, because they manage to capture life. Your dad sounds like he was a truly wonderful man.